NOTICE: Activation key must be used on a valid Steam account, requires internet connection. ABOUT THE GAME	When the evil railroad baron Clayton Boon decided to build a track to Hell, he didn’t reckon on a crazed shaman raising a posse of embittered psychopaths from the dead to stop him. Now they’ll pursue him across the whole Wild West, fighting their way through hordes of bandits, bears, … braves and boogeymen just to find Boon and repay their debt with… A FISTFUL OF GUN!Select one of eleven unique playable gunslingers and seek revenge as a lone wolf or with up to eight other bandits in local and online co-op. 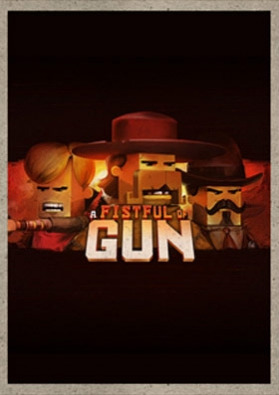 Master the specialized controls of each character, collect gold from fallen foes to purchase upgrades, and imbibe a bit of liquid courage and unleash a tornado of lead across the dusty plains.KEY FEATURES Misfits and Outlaws: Choose between eleven different gunslingers each with their own unique control scheme and methods of attack to master. Some characters require the finesse of a gamepad while others are strictly bound to mouse controls to mount their offensive. Multiplayer and Co-Op Modes: Gather a posse of up to eleven other players for chaotic local and online cooperative modes or square off with other gunslingers at the corral in the white-knuckled versus mode. Story and Arcade Modes: Take up arms against those that stand opposed and blast your way through the colorful landscapes of the west against dozens of unique enemies. Grab a horse, forge a river, ride a train – there’s never a dull moment in the lawless lands of the Wild West!SYSTEM REQUIREMENTS MINIMUM: OS: Windows XP or later Processor: Dual Core 1.8 Ghz Memory: 2 GB RAM DirectX: Version 9.0 Hard Drive: 600 MB available space Additional Notes: Gamepad, mouse, and keyboard needed to use all characters.